Squalamine was originally developed as an intravenous drug. In phase 2 clinical trials, it demonstrated a biological effect, a dose response, and a visual acuity benefit.5 However, due to its rapid clearance, pharmacokinetics, and impractical delivery, it was not pursued further. The OHR-102 topical formulation overcomes these challenges and can sustain therapeutic concentrations in posterior tissues of the eye. OHR-102 is a proprietary topical formulation of squalamine lactate designed to improve trans-scleral permeability and increase retention in the targeted choroidal tissue. This topical drug achieves sustained anti-angiogenic concentrations in the posterior segment. In May 2012, the squalamine eye drop program was granted Fast Track Designation by the United States Food and Drug Administration (FDA). The Impact Study is a phase 2 double masked, placebo-controlled trial including treatment naïve subjects with CNV due to AMD enrolled at 23 sites in the United States. Patients with classic or occult only CNV were enrolled, with a wide range of visual acuities and lesion sizes. Patients with known diabetes were eligible for enrollment. At baseline, all subjects received a single ranibizumab injection and were then randomized to either active treatment with OHR-102 or placebo vehicle drops administered twice a day. All subjects returned on a monthly basis for nine months and were retreated with ranibizumab as needed (PRN) based on OCT criteria. The study design is summarized in Figure 1. A planned interim analysis was conducted when one half of the subjects had completed their study visits, and data were released in June 2014. Baseline demographics are shown in Figure 2. In this group of 62 subjects, there was a rapid and increasing difference in visual acuity gains between the combination and monotherapy groups as shown in Figure 3. 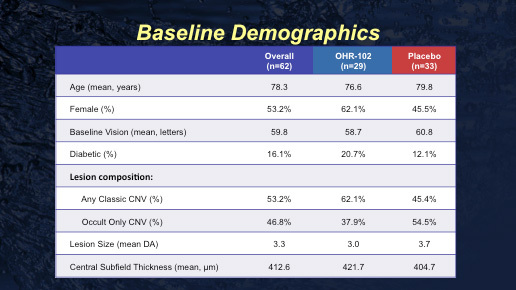 At week 38, 48.3% of OHR-102 treated patients showed gains in best-corrected visual acuity (BCVA) of ≥15 letters (3 lines) on a standard ETDRS eye chart, compared with 21.2% in the monotherapy arm (p=0.025). 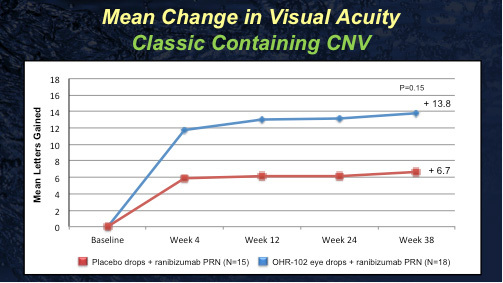 In addition, patients who received OHR-102 drops were more than twice as likely to gain ≥4 and ≥5 lines of vision compared with patients in the ranibizumab monotherapy arm (≥4 lines p=0.022, ≥5 lines p=0.059). Mean gain in visual acuity was +10.4 letters in the OHR-102 arm versus +6.3 letters in the ranibizumab monotherapy arm (p=0.18). Of note, the visual acuity gains for the ranibizumab monotherapy arm were consistent with those observed in previous clinical studies using ranibizumab monotherapy treatment. With respect to the number of PRN ranibizumab injections required according to the strict retreatment criteria (which were based on optical coherence tomography findings), there was no difference between the groups (6.2 for the OHR-102 arm compared to 6.4 for the ranibizumab monotherapy arm). Given that previous combination therapy trials have focused on classic lesions, a subgroup analysis was performed. In the group of patients with a lesion containing a classic component and a lesion size of up to 12 disc areas, 67% of OHR-102 treated patients (n=18) demonstrated BCVA gains of ≥3 lines on a standard ETDRS eye chart, compared with 20% in the ranibizumab monotherapy arm (n=15) at the end of the study (p=0.007). 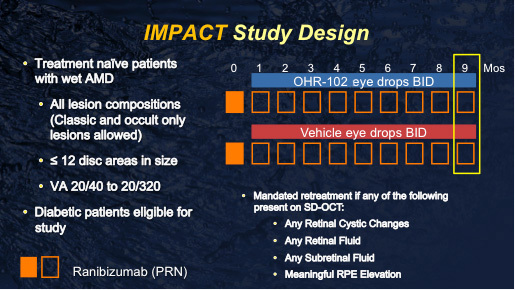 In addition, patients receiving OHR-102 drops were more than three times as likely to gain ≥4 and ≥5 lines of vision compared with patients in the ranibizumab monotherapy arm (≥4 lines p=0.05, ≥5 lines p=0.12). 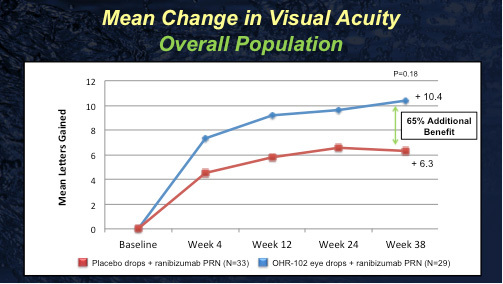 Mean change in visual acuity was +13.8 letters in the OHR-102 arm compared to +6.7 letters in the ranibizumab monotherapy arm (p=0.15). Anatomic results correlated with the visual acuity results. At the end of the study (38 weeks), the mean change in central subfield thickness was -139 μm in the OHR-102 arm versus -117 μm in the ranibizumab monotherapy arm. 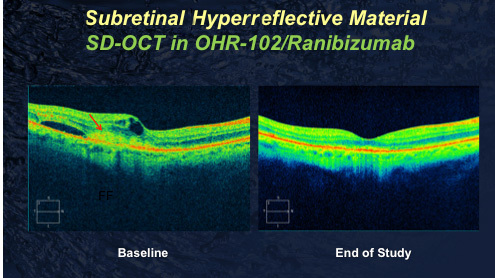 There was also corresponding improvement in subretinal hyperreflective material (SRHM), a biomarker for wet AMD, based on quantitative analysis of the SRHM at a large independent reading center. Only patients with measurable SRHM at baseline were included in the analysis (overall: n=27 in the OHR-102 arm, n=27 in the ranibizumab monotherapy arm; subset of lesions with classic CNV: n=18 in the OHR-102 arm, n=13 in the ranibizumab monotherapy arm). Subjects who received OHR-102 combination therapy demonstrated a 75% mean reduction in the area of SRHM compared to 56% in the ranibizumab monotherapy group. In addition, 59% of patients in the OHR-102 combination arm achieved complete resolution of SRHM versus 44% in the monotherapy arm. The mean reduction in SRHM correlated directly with the visual acuity improvements seen in each vision outcome category, with a greater reduction of SRHM in each consecutive vision gain category up to more than 90% reduction of SRHM in patients who achieved ≥4 lines (≥20 letters) of visual acuity gains. In summary, these interim results from the IMPACT Study demonstrate that a combination of topical squalamine (administered twice a day) in conjunction with PRN ranibizumab may be associated with superior vision outcomes compared to ranibizumab alone. A phase 3 clinical trial, with a primary endpoint of visual acuity at 9 months, is planned to begin in the first half of 2015. In this case of a subject treated with combination therapy, we see at baseline on the left there is subretinal hyperreflective material. At week 38, there is resolution of both the intraretinal fluid as well as the subretinal hyperreflective material and an absence of fibrosis. Disclosure: Dr. Ciulla is a clinical investigator in the IMPACT Study and has received contracted research payments supporting this work. 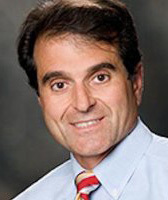 He serves on the scientific advisory board for Ohr Pharmaceuticals and has received consulting fees for this work. He also holds stock options on Ohr Pharmaceuticals. Reference(s): 1. Connolly B, Desai A, Garcia CA, et al. Squalamine lactate for exudative age-related macular degeneration. Ophthalmol Clin North Am 2006;19(3):381-391, vi. 2. Ciulla TA, Criswell MH, Danis RP, et al. Squalamine lactate reduces choroidal neovascularization in a laser-injury model in the rat. Retina 2003;23(6):808-814. 3. Genaidy M, Kazi AA, Peyman GA, et al. Effect of squalamine on iris neovascularization in monkeys. Retina 2002;22(6):772-778. 4. Higgins RD, Yan Y, Geng Y, et al. Regression of retinopathy by squalamine in a mouse model. Pediatr Res 2004;56(1):144-149. 5. Ciulla TA, Oliver A, Gast M. Squalamine lactate for the treatment of age-related macular degeneration. Expert Review of Ophthalmology 2007;2:165-175.